I'm going to end up hoarding E9Xs, aren't I? Vermilion Red metallic became an optional color when the E92/E93 got the LCI treatment for the 2011 model year. I’ve mentioned before that I really like the color; consequently, I’ve been looking for BMWs with the color checked off in the options box. 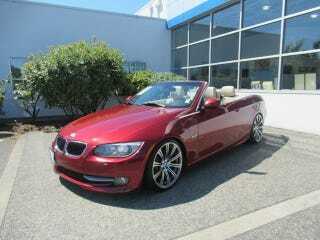 In my unnecessary car shopping, I stumbled upon this E93 328i, looking resplendent in Vermilion Red. Given the fact that I already own two manual BMWs, you can rest assured that this E93 is equipped with the preferential transmission. I do like the decision someone made to put style 220Ms on the car. However, I think they might have lowered it too much. Raise it up an inch or two and I would be on board. For a shade under 10k, it really isn’t that bad of a price. If I was in the market for a car, I might be scheduling a PPI and then booking a flight. That said, I’ve bought 3 cars and had 0 PPIs done.